Yesterday we published numbers ten to six; today we bring you the top five of most-read articles on PIPA. Click here to reread part one of our top 10 of most-read articles of 2015. We bid a final farewell to Etienne Devos earlier this year, and Georges Cartus sadly passed away in November as well, following a long illness. Mister Perpignan, as he was often called, created a pigeon breed that excelled across all disciplines. Georges was particularly successful in the long distance and the extreme long distance, winning most notably a national victory from Limoges and Perpignan. These victories will always be remembered, and we reckon the descendants of the Carteus pigeon breed will be making the headlines in the near future as well. The final race of the tenth edition of the Derby Arona took place in March and, as in previous years, the organisers had also invited PIPA. The event attracted a lot of attention, and our report was read by a high number of fanciers. This anniversary edition was one to remember. Not only did all finalists reach the finish line, the race also had a Belgian winner with Team Leyen-Paloma. 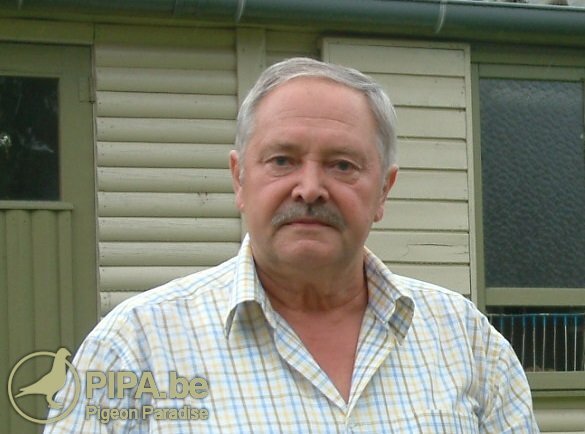 The 8th of August 2015 was a dramatic day for pigeon racing in Belgium. The release took place under a black sky, and the pigeons kept circling around the release site for a while. It indicated that the race would take place in severe conditions. By the end of the day just over 15% of all pigeons had made it back home by the evening. The race could only be closed 21 hours later, on Sunday 9th of August. Fanciers were outrageous and they demanded an explanation from the race organiser, the KBDB. They sent out a press release a few days after the race, which we think nearly every Belgian fancier has read. What was the outcome? Plans were made for the founding of a release commission, although none of the members of the National Sports Committee or the past general meeting (late October 2015) were willing to take up the responsibility. The idea is to lay the responsibility of the national races organised by the KBDB with three people: the chairman of the National Sports Committee Dirk Schreel, and a Flemish and Walloon commissioner. Thousands of pigeons had failed to get back home, and everyone wanted to know where they had gone. We provided the answer in the form of a map. Fanciers whose lost pigeons had been found were informed about their location. 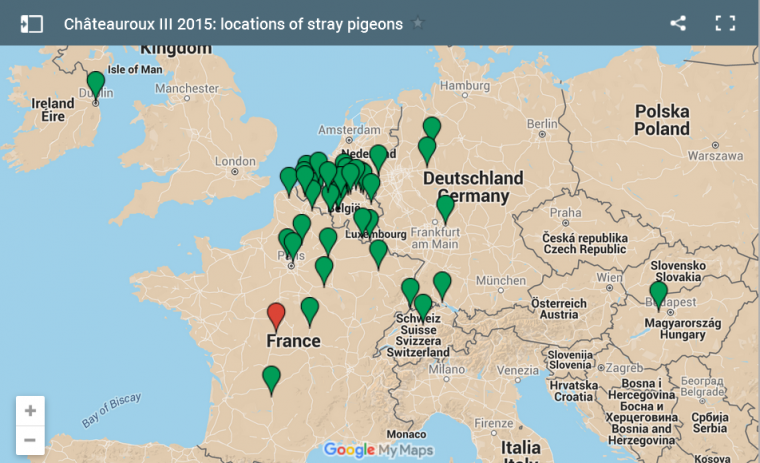 Unsurprisingly most pigeons were found in France and Belgium, although it is remarkable that several pigeons had been heading east, west or south. Some ended up in Switzerland or Central Germany, and a number of Belgian pigeons from Châteauroux had actually been found in Ireland or Hungary! Just to make things clear: the catastrophic race from Châteauroux 2015 has been widely covered in the media and it continued to be a hot topic for quite a while. The creation of a release commission remains a topic of debate, and this race has also put the remainder of the season in jeopardy for many fanciers. Many of them were forced to put an end to the season a few weeks sooner than planned. No wonder more than 160 comments were posted below the article that PIPA published after the fatal race, in which we also discussed the weather conditions. As far as this race goes, 2015 has not been a season worth remembering. We can only hope that next year's overview will have a different, more positive central theme.